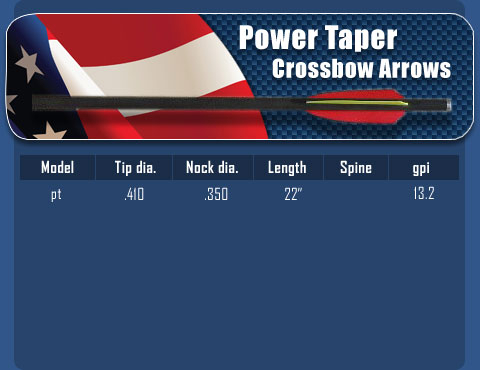 Arrow Dynamics Parallel To Taper design in a cross bow arrow- better FOC and less wind drift and the rear portion is elevated above the rail meaning greater fletch clearance. The Power taper incorporates our famous taper design which maintains its speed at longer distances and also penetrates 30% more than a parallel shaft and of course it is Made in USA. Prices displayed are per 6 arrows and include components.